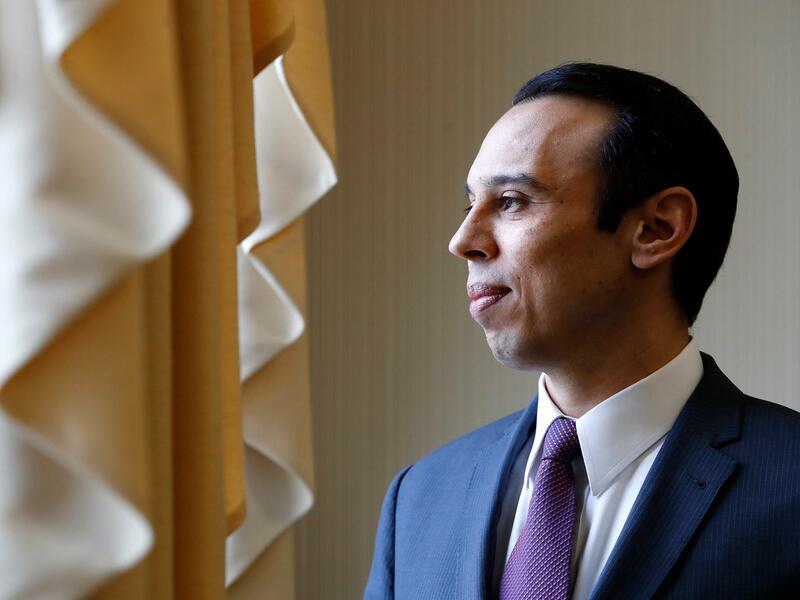 Critics of Roger Severino, director of the Office for Civil Rights at HHS, worry Severino's efforts on behalf of some health workers will reduce women's access to reproductive health services and could aggravate discrimination against transgender people. "I remember a white kid coming up, as I was in the pool, [who] said a racial epithet," Severino recalls. "My response as a kid was — I was confused, in a way. Why would they say such a thing?" Later, when he entered high school, Severino's counselor tried to steer him to shop class and vocational training. "And I said, 'Well, don't you offer honors classes?' " Severino says. "And the counselor, who was white, said, 'Yeah, but you'll have to take a test.' "
He took the test, got into the classes and eventually went to Harvard Law School, where he vowed to fight for civil rights. "I've been moved to help others who face much worse discrimination than I ever did get a chance at the American dream," he says. But since he took over as head of the HHS civil rights office a year ago, some advocates see Severino's tenure at the agency as more of a nightmare. "Director Severino presents himself as a civil rights lawyer. And what he has done as OCR director is turn the idea of civil rights on its head," says Harper Jean Tobin, policy director at the National Center for Transgender Equality. That's because Severino — a devout Catholic and political conservative — has put the right to religious freedom front and center in his fight against discrimination in health care. In public appearances he refers to religious freedom as "the first freedom." Since coming to HHS he has issued a rule that allows employers to refuse to cover birth control as part of their employee health insurance plans, if employers have a religious or moral objection to contraception. And earlier this year he created an entirely new division within the civil rights office — the Division of Conscience and Religious Freedom. Its mission, he says, is to ensure that health care workers and health care companies are never forced to participate in particular medical services — such as abortion and assisted suicide — if they object. When he was at the conservative Heritage Foundation, he also argued that health workers be allowed to opt out of participating in medical procedures that could further gender transitions. HHS's Office for Civil Rights has traditionally focused on making sure people are not denied medical care because of their race or gender. And it is charged with protecting patients' medical privacy. The office tends to get roughly 25,000 complaints each year. Under the Obama administration, those civil rights protections were extended to gay, lesbian and transgender people. At the time, Severino was working at the Heritage Foundation and called that interpretation of the law "radical." His aim, he says, is to tilt the balance back — to make sure people with religious objections are not forced in their work to violate their religious beliefs. "All we're doing is saying that we will be enforcing all of the civil rights laws," he says. "And all those civil rights laws include conscience and religious freedom. We believe they weren't given the proper attention for too long a time, and now it will be getting the proper attention it deserves." That's little comfort to Severino's critics, who say his efforts are likely to reduce women's access to reproductive health services and could aggravate discrimination against transgender people. Just a few weeks after he started at HHS, Severino met with representatives from several different advocacy groups — including Judith Lichtman, senior adviser to the National Partnership for Women and Families. She says Severino billed the meeting with about 20 people as a "listening session." "He opened the meeting telling us his heartfelt story about knowing and understanding discrimination," she says. "And, frankly, stories will get you just so far." Because he was "listening," Lichtman says, Severino declined to answer questions about his own positions on specific issues. But she believes his actions since then — including creating the religious freedom office — point to a desire to limit women's access to reproductive health services. "Abortion is a legal health care service in this country," Lichtman says. "And if, indeed, what Mr. Severino is intending to do is to undermine protections for women who are seeking a legal health care service, I'd say that's pretty abhorrent." Tobin, the transgender-rights advocate, was also at that meeting and has similar concerns. "No one is forcing doctors to perform gender-affirming surgeries against their will," Tobin says. "But what is happening every day, is transgender patients are being denied every kind of medical care you can think of." More than a third of the more than 27,000 transgender adults polled in the 2015 U.S. Transgender Survey said they experienced health care discrimination in the previous year. And a report by the Center for American Progress — which reviewed a subset of complaints to the office of civil rights — shows that the majority of discrimination complaints filed by transgender people were related to medical care that had nothing to do with gender transition. But Severino says it is equally alarming that doctors or nurses would be forced to violate their conscience to keep their jobs. He says since he arrived at HHS and made it clear he was open to listening to complaints of conscience, his office has received more of these complaints than were filed in all the Obama years combined. "America's doctors and nurses are dedicated to saving lives," he says. "And they shouldn't be bullied out of the practice of medicine simply because they object to performing abortions against their conscience." Jocelyn Samuels, who was the head of the office for civil rights during the Obama years, says she worries that under the current administration, the office will divert too much energy to handling a relatively small number of religious freedom and conscience complaints. The number of such complaints "pale in comparison to the thousands of complaints that OCR receives under the civil rights laws, and under HIPAA — the law that protects the privacy and security of medical information," Samuels says. Severino previously worked at the Becket Fund, a nonprofit law firm that focuses on religious freedom. According to the conservative Heritage Foundation, Severino focused while there on "religious liberty, marriage and life issues," as head of the foundation's DeVos Center for Religion and Civil Society. He also spent seven years in the Justice Department's civil rights division. He points to those years to reassure his critics that he will defend everyone with a valid discrimination complaint. Severino is particularly proud of a housing discrimination case he fought in the aftermath of Hurricane Katrina: In an effort to prevent blacks from New Orleans from moving into a particular neighborhood, a local community had banned some homeowners from renting their houses. A courtroom exhibit from the case — a map of the region with its racial breakdown — sits in the corner of his otherwise undecorated office. And, to underline Severino's civil rights credentials, his staff sent me a document titled "Proof of Impact of Roger Severino's Career in Civil Rights." I reached out to several people who have worked with Severino, and none would speak with me about him on the record. Those who spoke on background say he is honest and direct and has a way of connecting with his clients. And, they say, they expect he will apply the law fairly. Roger Severino is a successful civil rights lawyer. When he was at the Justice Department, he fought to uphold the rights of African-Americans trying to rent homes after Hurricane Katrina. And he won. For the last year, though, under President Trump, he has led the Office for Civil Rights in the Health and Human Services Department. And in that time, he has put the right to religious freedom front and center as he fights against discrimination in health care. Here's Severino back in January when he announced the creation of a Division of Conscience and Religious Freedom within HHS. ROGER SEVERINO: Times are changing, and we are institutionalizing a change in the culture of government, beginning with HHS, to never forget that religious freedom is a primary freedom, that it is a civil right that deserves complete enforcement and respect. MARTIN: NPR health policy correspondent Alison Kodjak has this profile of Roger Severino. ALISON KODJAK, BYLINE: There's a good chance you didn't know that the nation's health department has a team of lawyers dedicated to protecting your civil rights. Traditionally, they focus on making sure you're not denied medical care because of your race or gender or on protecting your medical privacy. Roger Severino says he plans to continue to defend those rights. But he's also made it clear that his top priority is to protect health care providers' religious freedom. SEVERINO: America's doctors and nurses are dedicated to saving lives. And they shouldn't be bullied out of the practice of medicine simply because they object to performing abortions against their conscience. KODJAK: When I sat down with Severino last month, he pointed me to his long and distinguished record of achievement in civil rights and says it took root in his childhood. He grew up in LA as the Spanish-speaking child of Colombian immigrants. SEVERINO: I had experienced discrimination as a child. And that leaves a lasting impression. SEVERINO: The menu of options I was given were remedial classes, the equivalent of shop class and a vocational class. And I said, well, don't you offer honors classes? And the counselor, who was white, said, yeah, but you'd have to take a test. KODJAK: Severino is conservative and a devout Catholic. He previously worked at the Becket Fund, a nonprofit law firm that focuses on religious freedom. And he ran a center on religion at the conservative Heritage Foundation. Since he joined HHS just a year ago, he's issued a new rule that allows employers to refuse to cover birth control if they have a religious or moral objection. And he created the new Religious Freedom Division to ensure that health care workers and companies are never forced to participate in medical services like abortion if they object. SEVERINO: All we're doing is saying that we will be enforcing all the civil rights laws. And all those civil rights laws include conscience and religious freedom. And we believe they weren't given the proper attention for too long a time. KODJAK: Severino's critics say his efforts are likely to make it harder for women to get abortions. But they could go much farther. Several of his critics, including Judith Lichtman, met with the new civil rights director shortly after he joined HHS. JUDITH LICHTMAN: He opened the meeting telling us his heartfelt story about knowing and understanding discrimination. And frankly, you know, stories will get you just so far. KODJAK: Lichtman is a senior adviser to the National Partnership for Women and Families. She says Severino's actions since that meeting suggest he intends to protect people who want to discriminate against women who want birth control or abortions, which she points out are legal health care services. LICHTMAN: I say that's pretty abhorrent. KODJAK: Harper Jean Tobin, policy director at the National Center for Transgender Equality, was also at that meeting. HARPER JEAN TOBIN: Director Severino presents himself as a civil rights lawyer. And what he has done as OCR director is turn the idea of civil rights on its head. KODJAK: Traditional civil rights advocates, she says, have fought hard to make sure everyone can get the medical care they need. But Severino, she says, is instead fighting for the right of doctors to discriminate. TOBIN: No one is forcing doctors to perform gender-affirming surgeries against their will. But what is happening every day is transgender patients are being denied every kind of medical care you can think of. KODJAK: She says more than a third of transgender adults said in a survey that they had experienced health care discrimination in the last year. I reached out to several people who have worked with Severino and none would speak with me about him on the record. Those who spoke on background say he's a straight shooter who has a way of connecting with his clients. And they say they expect he'll apply the law fairly. Alison Kodjak, NPR News, Washington. Transcript provided by NPR, Copyright NPR.